Was the timber sustainably grown? How far has it travelled? 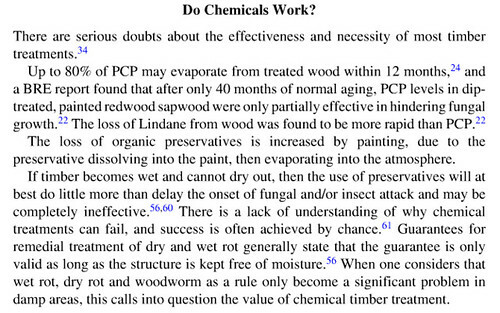 Does it contain chemicals such as adhesives or timber treatment? The FSCForest Stewardship Council (who accredit timber) see their database Woodmark or the PEFCProgramme for the Endorsement of Forest Certification. See their web site stamp are the most reliable means to know that the timber was sustainably grown. This is a ‘chain of custody’ method whereby woodlands are certified as being sustainable by a certifying body and then each piece of timber is marked, from the point a tree is chopped down right through to the delivery of sawn timber or a timber product, so that no matter how much batches of timber get mixed up during distribution, you can be sure it was grown sustainably. A somewhat different approach is to source your timber through local sawmills. This way you could check out whether it was grown in the UK but you might not get a woodmark on it (though it would probably be sustainably grown due to UK woodland policy). Sawmills often have access to stress grading for structural timber. This method leads to other possibilities. Very often UK sawmills handle locally grown hardwoods as well. If you need hardwood for other jobs in the building then this is probably a cheaper way of purchasing them than through a timber merchant, especially if you are flexible about the species you want. firstly, obviously, whether you have access to a good supply of logs of the type of timber you will require and are they of a sufficiently high standard? can you get the timber machined for its final purpose? boards for external cladding and rain screensthis is a (usually thin) outer cladding on a wall which prevents rain, snow, etc getting at the structure of the wall behind. see more on rain screens. Usually with Douglas fir, larch, western red cedar, sweet chestnut or oak, this is relatively simple and may not require further machining unless you want to plane them. These boards will usually be in the range of 150 – 200mm wide and 18 – 25mm thick (possibly in two widths if you are doing board on batten – and this will produce less waste in cutting as thinner sections can be utilised). scantlings, temporary works, fencing etc. Most building work utilises a considerable amount of low quality timber and this can be derived from the left-overs of sawing for cladding and structural timber. wood strip floors. Short and narrow strips of timber, usually in the range of 5 – 10mm thick can be glued directly onto OSBOriented Strand Board sheets on floors. This makes excellent and attractive flooring and utilises timber extremely well, especially hardwoods. It involves kilning the wood and machining it but this is not difficult. Because the volumes are relatively small the kilning can be carried out with an electric heater (or better still a solar kiln). The machining is easy using a circular saw bench and planer/thicknesser. The narrower the strips the less of a problem there is due to movement during kilning but the more work in machining and laying. timber for furniture. It can be a relatively simple matter of sawing timber for built in joinery, kitchen cabinets etc, largely because the timber sections are seldom thick and usually not very long. This means that drying and kilning don’t take so long (and this material is not needed till towards the end of the building work) and logs do not need to be of the uniform high quality required for structural work. So for instance if you can get your hands on some local hardwood such as cherry, ash, sycamore, birch etc. you can make unique furniture from locally grown timber. structural timber. The sawing of structural timber is relatively easy given decent log sizes but it will need grading by a licenced stress grader to meet Building Regulation standards, Part AThe Approved documentsApproved documents (England) are detailed publications which come under the English Building Regulations. They are based on tried and tested methods of building and if you follow them you are assured of complying with the Regs. The equivalents for Scotland are the Technical Handbook, for Wales: the Approved documents (Wales), and for N.I. the Technical Booklets, (England) part A, deals with building structures of the Approved Documents. They can do on-site visual grading but obviously you will need a fair amount of timber to make a visit worthwhile. To get in touch with a local stress grader, ask around timber merchants and timber yards in the area as they tend to use them occasionally. Structural timber will need air drying at least, possibly kilning down to around 12%. Timber can bend and twist quite a lot on drying and this is especially true of larch so it is best to overestimate the amount needed and then any bent stuff can be sawn down and used as scantlings etc. where the bend will not show up. One possible drawback with using locally milled timber is that stress grading may be a problem when it comes to needing structural timber which will satisfy the Building RegulationsThese are the mass of regulations that cover safety, health, welfare, convenience, energy efficiency etc. in the way buildings are constructed. Not to be confused with Planning consent (which is more to do with whether you can put up the building in the first place). See more on the regulations . However stress graders can be hired by the hour and if the requirement is to SC3 they will probably be able to go through a pile of timber in a few hours and visually certify it. See the Building Regulations Approved Documents, part A on structural requirements for roof and floor joists etc. Remember to avoid timber which is infected with woodworm or dry rot. Timber whith a larger cross section than you need will probably require cutting down and this is a very difficult business because of damaging saw blades. Every nail has to be removed and you will need a metal detector to find them. Occasionally you may find parquet flooring which has been set in asphalt. This is extremely difficult to remove from the blocks. There are a few merchants who specialise in supplying high quality resawn reclaimed timber for special purposes. An example is W. Machell & Sons Ltd of Guiseley. Fixed furniture tends to suffer from the vagaries of fashion and at its worst is constantly being replaced for something more up to date. See Alterations and fashion. This is especially true for kitchen units and fitted wardrobes. This can represent quite a considerable amount of embodied energythe total amount of energy it takes to make a material (or a building). See more on embodied energy and also pollution in terms of the materials such as glass, formica and particle boards etc. It also creates a considerable amount of land fill. The question is ‘How likely is the furniture to last well into the future?’ There are three aspects to this. Is it repairable if it should get damaged? For instance a solid timber worktop can probably have a burn mark sanded out whereas a laminate one is extremely difficult to repair. Is the design of sufficient quality that it will still be looked on as beautiful with the passing of time? 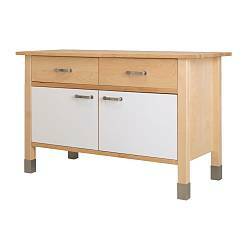 Less fitted furniture? Whereas fitted kitched furniture was almost ‘de rigeur’ until recently, Ikea seems to have almost single handedly challenged that concept with the various units in their free-standing range. These can make a lot of sense ecologically because they can be moved to fit changing needs or sold on if no longer required. In contrast, fitted kitchens are difficult to modify, especially if the carcass needs changing. The materials used in furniture should be considered for how sound they are ecologically and what effect they may have on indoor air quality. Particle boards such as chipboard can emit formaldehyde (which can be carcinogenic) for many years after manufacture and some European countries have introduced strict controls on emissions or outright bans on chipboard. MDFMedium Density Fibreboard generally has lower levels of formaldehyde and in some cases it is manufactured with zero formaldehyde, a process pioneered in Sweden. There is a general misconception about timber treatment. i.e. that almost all timber is better if treated (meaning treated against woodworm, dry rot and wet fungal decay). This is a blanket approach which does not properly address the needs of the building industry. Instead it tends to promote the widespread use of toxic chemicals when they are not needed. Timber which is kept at a moisture content of below an average value of about 18% (equating to an indoors rlative humidity of about 60%) is extremely unlikely to attract infestations of woodworm or dry rot. If timber is protected from rain and also from internal leaks such as leaking gutters or leaking pipes then timber will last indefinitely; probably many hundred years. There is ample evidence for this. Some of the oldest buildings in Europe are of timber and they have not been automatically treated with the sort of chemicals which are now commonly used on timber. Timber in an inhabited modern house normally has a moisture content of 12%-15% which is well below what will support dry rot or woodworm. However there can be problems with House Longhorn Beetle which has special provisions in the Building Regulations covering a few counties mainly South West of London. The third possible source of problematic damp is rising damp but this is covered by the Building Regulations part CThe Approved documents, (England) part C, deals with Site preparation and resistance to contaminants (C1) and Resistance to Moisture (C2) which insist on a damp proof course (DPCDamp Proof Course - a strip of (usually) plastic built into walls to prevent damp rising or penetrating. see more) between damp ground and the main habitable area of a house. Having said all this there may be an argument for treating the main timbers in a timber frame house such as a post and beamSubstantial, usually horizontal structural member. structure. The reasoning goes that maybe there might be a long standing unnoticed leak (roof, plumbing or bridging to damp ground) somewhere which could set up conditions which could cause dry rot. This sort of leak might happen if the dwelling was unoccupied for a long period or a small but persistent leak occurred. Then at least the main structure would be protected even if a limited area got affected. This would be similar to the risk with most masonry construction. Probably the best way of guaranteeing this level of protection is by using a boron based timber preservative (often called Borax for short). ‘Borax’ is a very benign but effective method of treating timber because it has a general toxicity which is on a level with common salt but protects timber particularly well. The only thing to notice is that because it is water borne it must not leach out from the timber. This is prevented by protecting the timber from water penetration in some way. The suppliers of various borax based products have information on this. Another possibility is to use acetylated timber. Acetylated timber is softwood timber that has been treated to make it as durable and resistant to rot as some of the best hardwood species such as teak. The treatment is based on a form of acetic acid which is simply a concentrated form of vinegar It is marketed as Accoya by Titan Wood Ltd. This is a relatively recent development in timber technology and has strong green credentials. The main drawback, as with much of the timber trade is the long distances travelled by the timber. Titan’s timber sources are global and the only treatment plant so far is in the Netherlands. caused by ugly joints between differing materials such as timber and plaster. caused by shrinkage or seasonal movement. They form a kind of sliding joint. The mouldings come in a variety of designs but several of the better known ones are shown below. Most timber yards will stock the common ones in various widths. Many timber merchants will run up custom designs at extra cost; useful if you are trying to match up to existing work. Small joiners shops will do the same providing they have a spindle moulder. Some of the very high skirtings you find in Victorian and Edwardian houses are too wide to get out of a single board and come in two matching parts. Traditionally the architrave mouldings match the skirtings but are smaller in scale; there’s no law about this. With traditional wooden panel doors there can be a considerable amount of movement between the panels in the door and the frame of the door. This is because timber expands when the air is more humid and it expands much more in its width than in its length. So in the image below the two top and bottom panels will expand and contract in width much more than the top and bottom rails will vary in length. Mouldings are used round the frame mainly as decoration but also partly to take the eye away from possible visual irregularities due to expansion and contraction. These are still there because the moulding moves with the frame but they are less obvious. and bolection mouldings which are a bit grander (some would say more bulbous). They totally cover the joint between frame and panel and they protrude from the surface of the frame. Other mouldings commonly used are dado rails, picture rails and covings at ceilings. Generally the junction between walls and ceilings is not a problem because they are both of the same material (some form of plaster). 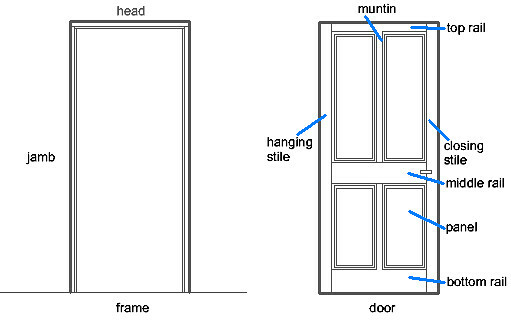 However if they differ, say plaster and timber boarding, then this is where a timber coving moulding might be employed. However the use of a shadow line may well look a lot better Picture rails go in and out of fashion (along with high level shelves for Toby jugs and general nick-nacks) Dado rails were originally applied as protection for the wall from damage by chairs etc. They are now mainly decorative but may also still give some some protection. 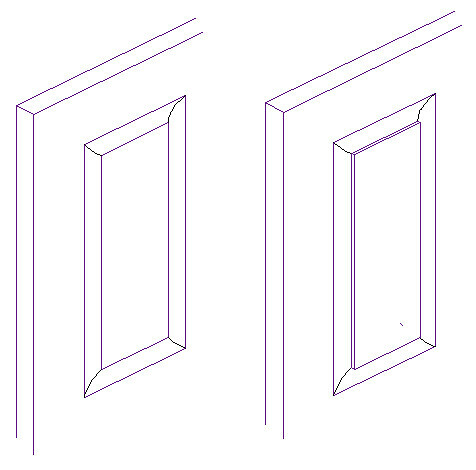 Door panels are sometimes plain but usually they have a moulding round the edge, either ‘fielded’ (on the left) or ‘raised and fielded’ (on the right).